I've seen a lot of these on FF, and a lot of other forums, So I'll give it a shot. Okay, So basically, I draw a photo in each of my posts. In each post, I'll give you some options. You're alarm goes off. What do you do? Then, I'll pick one or a couple and draw em'! You're sleeping, and your alarm goes off. It says 5:20 AM. > Turn it off, fall back asleep. > Get up, turn it off. 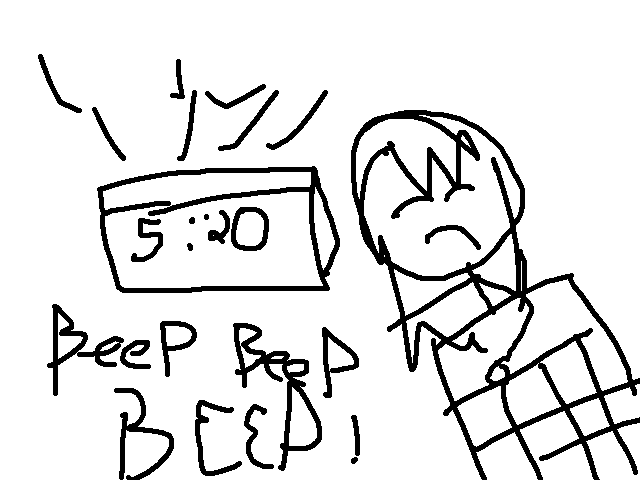 > Keep it on, go back to sleep while It's beeping. > Get up, turn it off and go to the bathroom. >Let it die down, and then go downstairs for breakfast. > Get up, turn it off. You obviously have something to do this morning, otherwise you wouldn't have set your alarm clock so early. >You get up, turn it off and go downstairs for breakfast.